September | 2017 | It's All About Code! Enterprise Connectors allows you to connect from Delphi and C++ Builder to 80+ enterprise data sources: https://www.embarcadero.com/products/enterprise-connectors. Between these datasources, we have Salesforce, probably the #1 CRM in the world. To demonstrate how easy is to use the Enterprise Connectors with FireDAC, I decided to build a native Salesforce mobile client for Android and iOS, using Delphi and Firemonkey on the client side, and DataSnap/FireDAC on the server side. 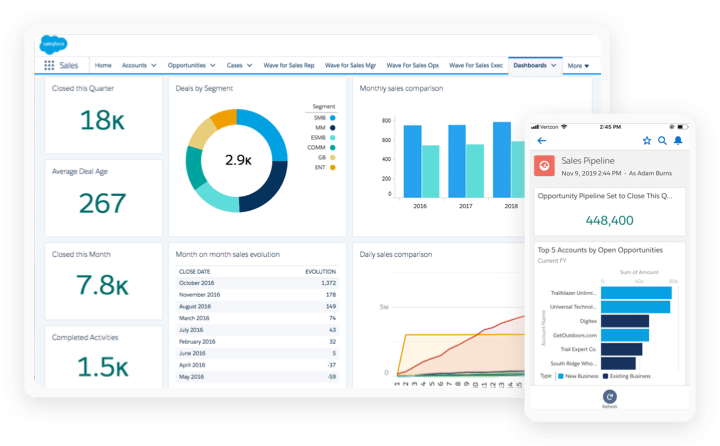 In summary, the idea is to allow the mobile application to display data from Salesforce cases, a kind of support case management that is part of their CRM solution. To accomplish this task we’ll have an FireDAC Salesforce connection in the DataSnap server, which will allows us to validate the user credentials, as well to query the cases entries directly from the Salesforce in the clouds. The cool thing from the Enterprise Connectors is that, you basically can issue standard SQL ANSI queries against any supported data source, easy as 1,2,3. As you can see in the image, it’s a standard FireDAC implementation, the only difference from connecting a regular database are the parameters. In this case, for Salesforce, you can create an developer account in https://developer.salesforce.com. Again, it’s a standard DataSnap/FireDAC server, serializing and returning the JSON data to the client, in this case an multi device application with FMX. Our client application has a login form, a ListView using the Dynamic Appearance style to display the cases data, and an third tab that shows all the selected case details. There are some other details in the client application, like saving the login information, the general app workflow, look&feel and etc., that you can review downloading the samples in the link by the end of this post. And stay tuned, next week I’ll show how you can easily connect an real SAP/R3 implementation directly from an Delphi or C++ Builder, and display/modify some data from the ERP, with almost no code! ps: in order to run the sample, you’ll need to create an Salesforce developer account and add the login information and security token in the FireDAC connection before trying to run.